This item is hand-crafted and made to order in Portland, OR. These thick bead stacking rings are perfect for mixing and matching! Either wear several at once or mix some in with your favorite rings for extra width and sparkle! Each thick stacking ring is individually cut, soldered and polished for a beautiful hand-crafted, high-quality ring. I hammer each ring for an extra sparkly texture. These "thick bead" stack rings are very similar in size to the extra thick stacking rings. Each ring measures approximately 2mm in width. This listing is for ONE SINGLE ring. 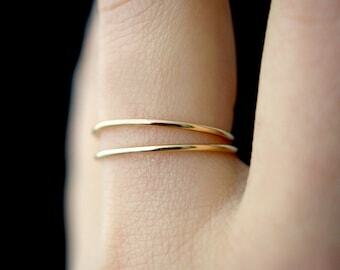 This ring is made out of thick, 14K gold-filled metal. I make these rings to order, so please allow 2-5 days for your ring to be crafted and shipped out. Please let me know your ring size in the Seller's Box at checkout! Want a different quantity? Message me for details! Every piece is organic and unique -- no two rings are exactly alike. Premium Gift Wrap for Rings & Earrings! If you would like gift wrap for a necklace feel free to let us know! My bead ring is lovely! 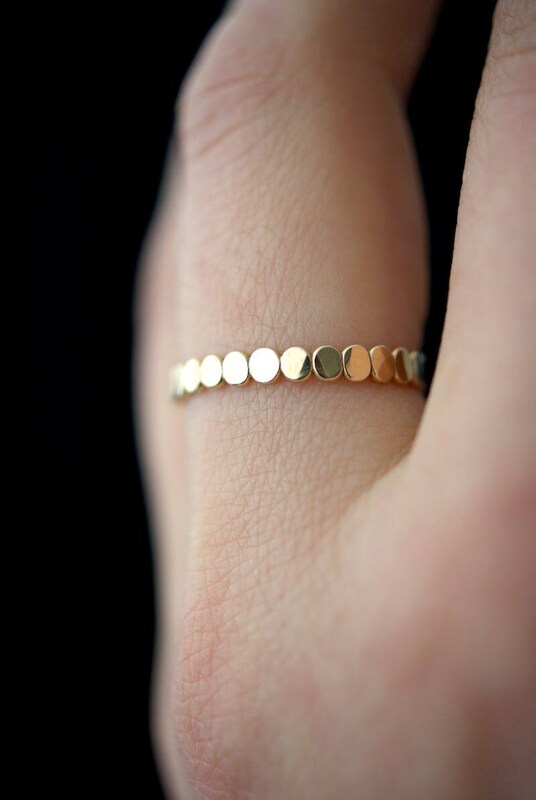 I have begun collecting 14k stackable rings and this ring is a stunner. It is thinner than I expected but stackables seem to run thin. 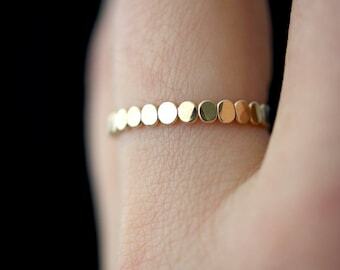 I will purchase a solid gold bead ring in the future! Hannah was delightful and I will definitely continue to purchase from her. Gorgeous ring, true to size, excellent craftsmanship, speedy delivery, Thank you!! It’s not exactly like the picture, the circles are ovals and they’re not flat they’re hammered , it’s still pretty though. I accept Paypal and credit cards through Etsy's direct checkout system. Not Satisfied with your order? Please don't hesitate to contact me! I want to make sure you'll be happy with your purchase. ** Returns, exchanges and re-sizing's must be received within 2 weeks of receiving your order. ** Since I make everything to order I am unable to accommodate returns outside of that window. For resizing requests after the 2 week period there will be a $15 charge per ring/ring set plus shipping. Please do not leave negative feedback for situations that can be easily resolved. We are a very small team and we do take our work and our Etsy shop very seriously. If you have an issue please send a message via Etsy convo. Please note that I may require returning shipping fees to be paid for re-sizing requests and/or exchanges. A 15% fee will be deducted from a return that is not in original condition. If you paid via Paypal please make sure your Paypal ship-to address matches your Etsy ship-to address! I will do my best to contact you about any discrepancies but I ALWAYS use the Etsy ship-to address as my preferred shipping address. All items are shipped either via USPS First Class Mail ($4.75) or USPS Priority Mail ($7.75). Once your package has been shipped out you will receive and email confirmation from Etsy with your tracking number. USPS Priority Mail parcels are insured. If you need extra shipping services (ex. signature confirmation, extra insurance) for ANY item, please let me know before you checkout. I will set you up with a custom listing that accommodates the extra expense. Insurance is very inexpensive -- between $2-$4 for most items. ** PLEASE NOTE -- the postal service occasionally loses packages or delivers them incorrectly! If you have ANY concerns about receiving your package, please don't hesitate to order upgraded shipping services (like signature confirmation)! They are inexpensive and will ease your mind (and mine). *** There may be additional CUSTOMS TAXES or FEES due when you receive your package -- these are your responsibility and vary dramatically between countries. *** Please contact your local post office for more details. INEXPENSIVE SHIPPING: Most listing currently show $14.75 international shipping ($9.75 for shipping to Canada). This fee covers USPS First Class Mail International, a service that usually takes 2-6 weeks for delivery. This is the cheapest and slowest option available. Faster/more secure options are available for an additional fee. See below for details. UPGRADED SHIPPING: Some international orders may be shipped via USPS First Class International Mail with the added service of REGISTERED MAIL ($22). This option can take up to 2-6 weeks for delivery, but it's the most secure way to ship packages. Registered Mail includes international tracking, partial insurance coverage, and requires a signature upon delivery. Depending on your location and/or order amount I may ship your package via USPS Priority Mail International instead -- it's faster (2-3 week delivery) but not as secure (no tracking, signature confirmation, or insurance). I reserve the right to decided which service I use. If you would like an upgrade for faster delivery please contact me BEFORE you checkout. I will set you up with a custom listing to cover the difference in cost. Important notes about international shipping: if you do not receive your package within 6-8 weeks, check your local post office (packages are often held there)! Packages that are returned to sender due to inaccurate address or unpaid VAT will be held for two weeks after the customer is contacted. If the customer does not reply store credit will be issued for the merchandise total. Shipping fees are non-refundable. International packages that need to be re-shipped may require additional shipping fees. + PLEASE NOTE that I cannot mark international orders as "gift". That is considered mail fraud by the US Postal Service and is a federal crime punishable by severe fines or jail time. Please note that I will not break the law in order to avoid the customs/duty fees of your country. ** Please note that shipping upgrades are non-refundable, even in the unlikely event that the Post Office delays your package. I will do my best to ensure prompt delivery but can't control what happens once I send out an order. Please ask questions! I do my best to respond promptly to any inquiries so if you're unsure about anything (ex. fit, color) send me a message! I usually respond within a few hours. ---Send me a message through Etsy describing the piece you would like (metal type, thickness etc.) and please include applicable photos if available. If you have a strict price range please let me know. ---Once a design and price point has been agreed upon I will work on a sample of the piece within 2-4 weeks depending on the intricacy of the design. ---I will send you photos of the finished sample when it is completed. ---If you would like changes made feel free to let me know (note changes may take another 1-3 weeks depending on the level of difficulty and additional fees may apply). ---If you are satisfied with the design I will set up a custom listing for the price agreed upon. ---Custom orders are non-returnable so please make sure that you are satisfied with the photos of the piece before confirming your order. Exchanges for ring size are accepted but please note that the exchange may take 2-3 weeks. *PLEASE NOTE* Pricing for custom orders will reflect the labor hours required, materials used AND a $15 - $30 fee that will be dependent on the difficulty of the piece and how drastically it differs from designs I currently make. NOTE: I do my best to be environmentally and socially responsible. I use biodegradable, recycled, vintage, and reclaimed materials where every possible. My jewelry line is truly artisan, unique and one-of-a-kind.